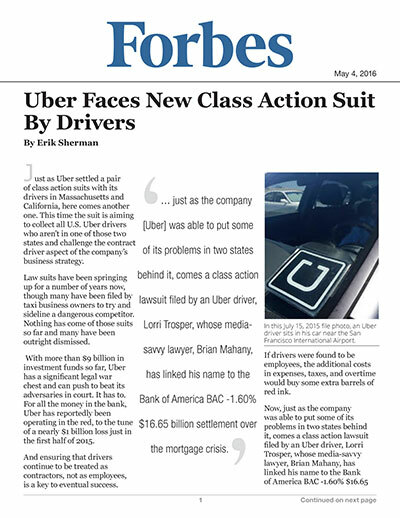 Just as Uber settled a pair of class action suits with its drivers in Massachusetts and California, here comes another one. This time the suit is aiming to collect all U.S. Uber drivers who aren’t in one of those two states and challenge the contract driver aspect of the company’s business strategy. Law suits have been springing up for a number of years now, though many have been filed by taxi business owners to try and sideline a dangerous competitor. Nothing has come of those suits so far and many have been outright dismissed. With more than $9 billion in investment funds so far, Uber has a significant legal war chest and can push to beat its adversaries in court. It has to. For all the money in the bank, Uber has reportedly been operating in the red, to the tune of a nearly $1 billion loss just in the first half of 2015. And ensuring that drivers continue to be treated as contractors, not as employees, is a key to eventual success. If drivers were found to be employees, the additional costs in expenses, taxes, and overtime would buy some extra barrels of red ink. A PR person for Mahany sent over a copy of the new complaint. It alleges that Uber misclassified drivers as independent contractors, failed to pay overtime wages and compensation, owes expense reimbursement, and didn’t turn over gratuities. It may be that this is, as some will likely claim, nothing but a shakedown of a business by plaintiff attorneys trying to make a big score. Uber just agreed to pay $84 million, plus potentially another $16 million, to settle the Massachusetts and California suits. Certainly the other suits ended up folding under a high-profile lawyer once a settlement was possible. A settlement here could significantly help Uber, as a class action in this case could collect all other U.S. Uber drivers together. Giving a concession, even a big one, could pay off handsomely and leave Uber with a degree of certainty not within grasp before. It seems hard to believe that the company wouldn’t ultimately settle just to get these types of attacks off its back. Even if the price were several hundred million, the benefit would outweigh the pain. That is why the chance that Uber drivers will get themselves treated as employees, not as contractors, seems increasingly unlikely at this point. No settlement would happen without a stipulation that the drivers were contractors and would remain so. With the turnover that Uber sees, it’s still possible that some government agency might yet say that any agreement about independent contractor status wasn’t valid. But will it bother if so many drivers agree to be contractors? There’s no way to know what will happen, but it seems like the card decks are quickly lining up in favor of the company, not the drivers. That could help cement a future of on-demand employees chasing gigs and having to learn how to make enough to afford healthcare, retirement, sick days, and educational benefits many often take for granted.